The 2001 Reprint of the FORA Base Reuse Plan is made up of four (4) volumes. 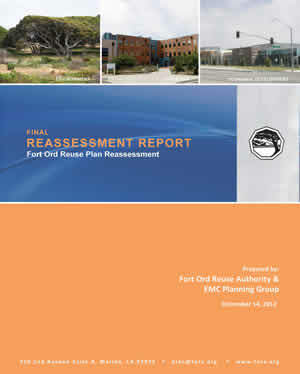 Throughout 2012, FORA conducted a comprehensive reassessment of its 1997 Fort Ord Base Reuse Plan (BRP) to evaluate progress toward implementing economic recovery and reuse of land at the former Fort Ord. V. FORA Procedures and Operations. On May 17, 2013, the 2012 Reassessment Report received an Award of Merit for Best Planning Practices from the Northern California Chapter of the American Planning Association. In February and March 2013, FORA held the first two of three “Post-Reassessment” Board workshops to establish priorities for policy action items. To further that objective, FORA Board Chairman Jerry Edelen appointed a Post-Reassessment Advisory Committee (PRAC) at the March 2013 workshop. The PRAC, composed of seven Board members and focusing primarily on Category I and Category IV issues, was formed to develop a balanced and manageable set of policy priority recommendations for the Board’s consideration. The PRAC held its sixth meeting in late-June and presented its recommendations for near-term (Fiscal Year 2013-2014) priorities at the Board’s June meeting. On May 17, 2013, the Northern California Chapter of the American Planning Association recognized the 2012 Reassessment Report with an Award of Merit for Best Planning Practices. To access the full report, CLICK HERE. On March 9, 2018, the Board accepted a staff report on Category I BRP text and figure corrections. Category I originated in the 2012 Reassessment Report and was reviewed by the Post-Reassessment Advisory Committee (PRAC). Staff presented PRAC’s Category I review to the FORA Board May 10, 2013. The corrections are all errata, such as typographic errors or missing phrases in programs which caused some confusion between Vol II and Volume IV of the 2001 republished Base Reuse Plan. Please consult these redline corrections (red color for new wording, red strikethrough for removed wording) when considering the required policies and programs for base recovery and reuse on former Fort Ord.Twenty-six figures were also corrected, following the Reassessment Report and PRAC. They are available on the Base Reuse Plan Maps and Figures page.